Looking for that perfect place in Baliuag, Bulacan for you and your family or friends to convene? How about A SQUARE? Read on to know about this commercial center's merchants and upcoming events. 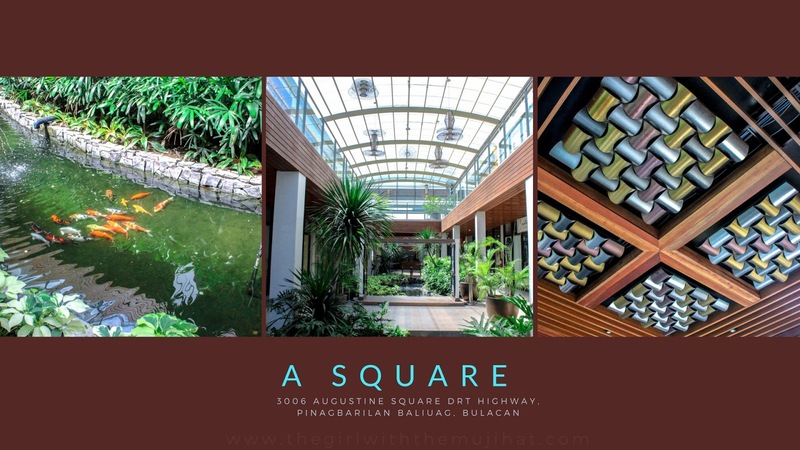 A Square, originally known as St. Augustine Square, is a commercial center that aims to bring the culture of Bulacan in one convenient, attractive yet less crowded space integrating business, social activities, wellness, and community services. Located along Pan-Philippine Highway, this community buzz hub is built to offer shopping, dining, and entertainment experience with leisure and grace. One of the projects of St. Augustine Realty & Development Corporation (SARDC), A Square is created to deliver progress to the enterprise community of Bulacan through high-quality land development and commitment to support homegrown businesses. Here, shoppers and patrons can buy some of Bulacan's major products such as furniture, garments, and native delicacies to name a few. The construction of this two-storey commercial building was completed in March last year. Initially, developers had a strong interest in positioning it as a shopping mall, but due to the lack of anchor merchants, A Square was launched as a community hub instead. Early this month, I and fellow bloggers met up with Sir Myke Celis, A Square's marketing executive, and went around to check on the property and interview its current merchants. A Square houses government agencies like Pag-ibig Fund Office. Members can securely make transactions here instead of traveling to the next provincial service branch is located in Malolos. If you want to subscribe to '100 percent new and digital high-quality audio and video cable channels', you can choose from postpaid and prepaid hd plans of Cignal Cable Provider. They install cables for free! Contact them here. Purchase trendy and elegant bags and accessories from Hongkong at Honey Lyn. Buy your first bag and avail discount on their watches! Feast on a Filipino buffet meal at Rosemary's Kitchen for Php 199. Dine here with your family or friends; if you make a group of 8, you need not to pay for 1 person. We recommend you try Chicken Caldereta and maybe pay a bit more for a glass of wine. The interior of this restaurant is cozy and clean with appropriate music to complete your dining experience. Grab a lunch or dinner here, your Php 199 can go a long way. Get your hair pampered at Creations by Lourd Ramos at A Square. This salon uses organic hair dye and employs trained stylists from Creations main branch. If you have your hair treatment here, reviews say 'you can expect wonders!'. As for me, it's important to note that they SELL iCURE here for PHP500! LOL I wish we had this salon in my hometown. Open a physical "office" for your online shop through this genius space renting business - one box is at Php 1000 per month. You can stash your products here and direct your customers for meet ups and purchases. If you are a shopper, visit pick-a-box for some awesome picks like authentic fragrance and cosmetics or a bikini top at PHP 99! Bikini top and bottom from pick - a - box! Book package tours to Palawan or other domestic and international destinations like Hongkong through Citi Gate Travelplus. Purchase wholesale or retail school and gift supplies at Adriano's. At Navarro's Furniture, you can find a 100 year old Cabinet made from Narra wood. Shop for antiques or vintage collections at Navarro's, you can definitely find precious furniture to add to your collection. No need to go to Divisoria for high-quality, affordable shoes. iCON has them all. You can get a pair for less than Php 1000. The style and comfort to the sole are notable! Hapag's Buffet food warmers are inviting! Bavarian Coffee is another homegrown business that serves delectable coffee and cake menu. You can hang out here and appreciate the interiors and serenity. Power outlets are placed everywhere for your electricity necessities. Work here or study here and be sure to try their Bavarian Coffee and Classic Sansrival. Treatments at Baan Khun Thai are inspired by authentic Thai massage and aroma therapy. You can choose from a comprehensive menu of relaxing spa treatments delivered by trained therapists. Don't forget to try their signature treatment: Thai Body Massage with Bentosa. Open Mondays - Sundays 12:00pm to 12mn. This month of July, A Square is launching an open-air bazaar to showcase 32 varied merchants from around the metro. Bulaceños and visitors can enjoy a month-long shopping and entertainment at A Square's spacious grounds. Vacationers coming in and out of Bulacan can comfortably drop by A Square for a quick coffee or to shop for travel needs - just like what we did before we headed straight to El Masfino Hotel & Resort - we bought swim wear from Pick-a-box! Travelers can also have a sumptuous lunch at Hapag's buffet restaurant or Rosemary's Kitchen. At the very least, this community center will help in your lavatory needs... Mind you, it has well-kept comfort rooms! If you are a nearby resident, A Square is an excellent meeting point for you and your family to convene! Visit A Square at 3006 Augustine Square DRT Highway, Pinagbarilan Baliuag, Bulacan. It is open Mondays to Sundays from 7AM to 12MN. Commercial and Bazaar spaces are still available for lease. You can inquire through A Square's Facebook link. Have you been to A Square in Baliuag? What do you think about it? What merchants do you want to find in your community hub? Let us know your thoughts below! And if you find this article helpful, do share it on your social networking sites!